Roger Rushman is an owner and Executive Vice President and Regional Sales Manager of First Weber Group Realtors, Milwaukee. Roger also is General Sales Manager of First Webers Lake Country office. Roger has been in the real estate industry for over 30 years. 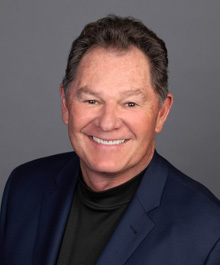 He was the 2006 Chairman for the Wisconsin Realtors Association and currently one of there Directors and a past Director of the Greater Milwaukee Area Realtors. Roger loves to play golf and is very involved in the Lake Country community having coached baseball, basketball and football. Roger lives in Oconomowoc with his wife Nancy and children, Charles 25 Kelly 23. Question: How did you get into the real estate business? I grew up around the real estate business. My father started in real estate with Cliff Robedeaux in the early seventies. Question: What qualities do you think make a successful REALTOR? First and foremost - passion. If you are not passionate about what you do, your customers and clients will sense that. To be successful, you have to eat, sleep and breathe real estate. Along with that, you have to know how to balance between your business life and your family life. A sense of humor is another trait that I see in the most successful agents. Question: What tips would you give to a Realtor who is just starting out? Success breeds success. I think the most important thing a new REALTOR can do to insure their success is to surround themselves with positive, successful people. This includes supportive and knowledgeable management and successful agents who are willing to mentor, give advice and share their success stories with newer agents. Question: What changes do you see in the future for the real estate industry? I think we will continue to see changes taking place to the traditional transaction model in terms of the consumer's ability to access information prior to establishing a relationship with an agent. However, I feel it is essential for Agents and Brokers to understand that in order to best serve Customers and Clients, is that good Agents need good Brokers and good Brokers need good Agents. This will require that we keep up with emerging technologies, real estate legislation, and other trends that affect the level of service we give to the agents, which will, in turn, affect the level of service they give to their customers and clients. Question: Where do you see First Weber Group Realtors in the next several years? Expansion and growth! Our future partnerships with strong, local companies will continue to brand the First Weber Group name across Wisconsin.